The adaptor can be used with Porvair’s Biofil, Fluorofil, Polyfil and Microfil junior filter ranges. Porvair has announced the addition of the 4-lug adaptor to its junior filter range for small-scale applications. The 4-lug junior cartridge is available with a range of media for filtering gases and low volume liquids for pharmaceutical, food and beverage and process applications. The 4-lug filters are designed for applications requiring retention of bacteria in liquid and venting applications in sterile environments using Porvair’s sterile membranes. The adaptor is designed with double O-rings to provide total security where sterility is of paramount importance. For aseptic applications a junior cartridge with a 4-lug adaptor can be used for in-situ SIP and CIP regimes, in closed systems. The adaptor can be used with Porvair’s Biofil, Fluorofil, Polyfil and Microfil junior filter ranges. 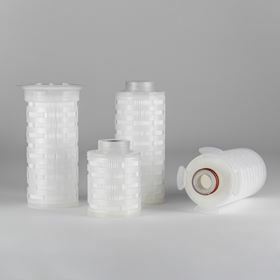 For non-aseptic applications the 4-lug filters can be used with Porvair’s Polyfil and Microfil media, used for processing inks, chemicals and water where volumes are low or multi-pass fluid paths require absolute level filtration. The catalogue includes a new range of nominal filters. Fibre mesh composite for filter elements. The customer had stringent requirements for a clean filtration system.